During the inception of Scaterd-Few, I learned of the existence of a DC band called bad brains. I was instantly a fan. I went to every show I could that they had in my area. 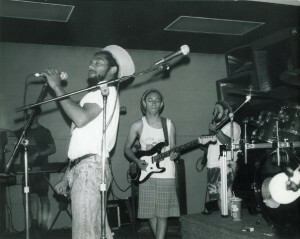 It was also at this time that I learned that H.R., lead singer of bad brains, had a side project called Human Rights. In the late ‘80’s, after attending many H.R. shows, my brother, Allan, struck up a friendship with H.R., and we began to hang out with either of the bands that H.R., who will now be referred to as Joseph, was in town with. The coolest thing about that time period was that it was never an artist / fan relationship with Joseph but rather a real friendship that struck up between us all but mostly with the band Human Rights. In September of 1990, Joseph asked my brother, Allan, if Scaterd-Few would be his backing band in support of his latest solo release on SST records called Charge. The choice was obviously a no-brainer. We rehearsed the album for a couple of weeks and kicked off a month-long, west-coast tour at a club called Bogarts in Long Beach, CA. I kept a journal back then, and I wrote on 9/23/90 about the show on the 21st, “Bogarts was intense. There was an opener, Sublime was their name. They were a white surfer bay youth reggae band. Youthful in approach but they met their challenge well.” What a trip, Sublime was the opener. 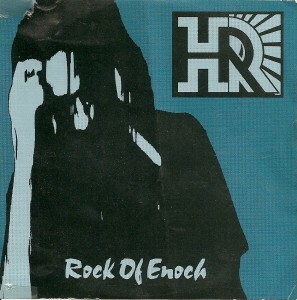 This all led to us recording the single Rock of Enoch with Joseph. We recorded the session on October 9, 1990 as far as I can figure from my journal entries. It was released in 1992 by SST Records, and I had a blast recording that session. It has a great groove, and I lay down some solid fretless bass lines and throw in a tasty harmonic slide in the main hook. If you can find it, get it.